Last Wednesday February 20, 2008, a lot of Nicaraguans got an amazing "sky show", when Sun, Moon and the planet where We walk on every day, the Earth got together in a perfect dance. 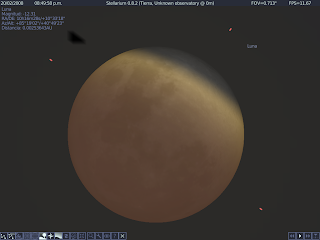 Early in the afternoon in Granda, Nicaragua (my point of view), I didn't see the Moon by cause of a cloudy sky, about 7:30 PM it started to rain, so I decided to install in my computer this program: Stellarium, because I didn't want to lose the eclipse by cause of the bad weather. 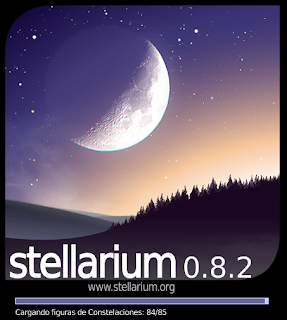 Stellarium is a free (libre) software, you can download it from its official home page: http://www.stellarium.org/, it works on Windows, Linux and Mac OS X. If you have played any 3D game, you will learn easy how to use it. If you didn't see the eclipse, don't worry, at same time that Stellarium can send you around the world, it can work like a "time machine", that means you can "go back in time" and see the eclipse step by step, in virtual form. Fortunately in Granada, near to 8:20 PM, the sky cleared and the rain stopped, and I could see in the real world the last lunar eclipse in this decade!. 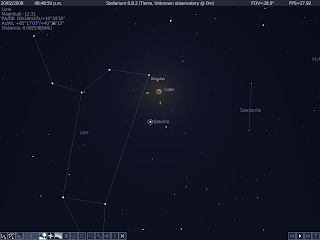 By the way, I realized through this great software, Stellarium, that the shining star near to the Moon was not a star, but it really was Saturn planet, I learned it thanks to Stellarium, you can see about it on next image. Please excuse my english, english is not my first language, but I'm learning. Publicado por Unknown en 6:01 p. m.